Four pairs of metal containers, each pair containing water at various temperatures. Just before inviting the child, the bottles need to be prepared. Then invite the child to come and work with you. Bring the child over to the material and tell him that today we will be working with the Thermic Bottles. Have the child bring the tray over to the table and have him place it near the top middle of the table. Then have the child sit on your left. - Take out the first set of the bottles. - Then have the child feel each of the bottles, one at a time. - Take out the second set. of bottles but with a rather large gap between the two lines. - Bring the bottle with the pink dot up near you and feel it. - Bring forward the first bottle from the right line and feel it. the right (or second) line. match for the first bottle. - Once you find a match, allow the child to feel it to check. - Replace the bottles that did not match the first bottle into the right line. as with the first bottle. - Repeat until you have found the match for each of the bottles. 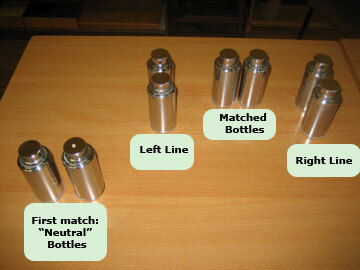 - Place the bottles back into their two lines and mix up the right line. - Then allow the child to match the thermic bottles. The child works individually with the thermic bottles as shown during the presentation. The child is shown how to grade the thermic bottles by using one of the sets. The ability of the child to discriminate temperature. Because the bottles need to be prepared by the directress, do not leave the tray of bottles on the shelf if they are not ready to be used.